I’m dedicating this to those who want to enjoy and explore the Android experience but are not buoyant enough to exit entry level smartphones. Itel now has models running on Mediatek and Spreadtrum so you can tag along if you have any Mediatek (MTK) or Spreadtrum (SPD) entry level smartphone you wish to optimize for a better experience. 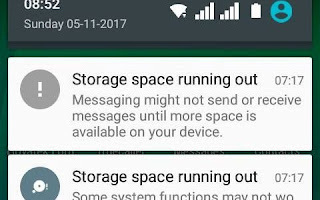 Messaging might not send or receive messages until more space is available on your device. Some system functions may not work. This is one of the first hurdles you’ll encounter once you’ve started installing apps. What is this error and why am I getting it? Your phone has an internal storage where apps and their data are installed to / saved. The problem here is that its a partition which is allocated a limited space so you could have a lot of space on your external SD card and Phone storage but still encounter this error. The root of this error is that you’ve used up the allotted space for apps and their data either due to that space being too small or you having installed too many apps. Slight lagging is something to expect with use but its particularly terrible on low RAM phones. This could result in frequent restarts or unfortunately **** has stopped errors. Why is my Itel phone lagging / hanging seriously? Well, first off, Itel isn’t exactly notorious for being generous with RAM on their models. Apart from the Itel S11 Plus , Itel Wish A41 Plus , Itel S41, and maybe a model or two I forgot to mention (which I kind of doubt), Itel phones traditionally feature either 512 MB or 1GB of RAM. Now, the problem isn’t only the low RAM but also the system apps (Bloatware) which the phone is bombarded with from factory. Create a ROM Zero: To create a stock flashable zip (ROM Zero), all you need is a custom recovery, stock boot.img and system.img . If you have the Mediatek firmware then you’ll find boot and system in the zip or rar file. For Spreadtrum pac files, you can extract the content of the pac file using Research or Upgrade Download tool. Unless you’re using an Itel phone with 5,000 mAh, you’re likely to encounter a relatively short battery time. This is often facilitated by or coupled with overheating. Someone exaggerated that he could cook beans with his Itel phone 🙂 . Low end / entry level phones don’t handle duress too well and overheating is one way they voice out. Its quite normal to notice your Itel phone warming up slightly while charging or using but if it gets really hot then there’s likely a hardware issue lurking in the dark. Low end phones with crappy hardware will overheat regardless of what you do but Itel isn’t exactly crappy. When it comes to USB connection, Spreadtrum (and by extension Itel phones) are another kettle of fish. Some of these issues also surface on Mediatek smartphones though. What are the USB connection issues I might encounter on my Itel Android phone and how do I resolve them? Itel has made notable improvement and I believe they hold promise. I’m watching this brand keenly and only time will prove me right or right. This post was first published on Hovatek Journal, if you want to download the external files mentioned in this lecture, kindly check Hovatek Post. YOUR COMMENTS ARE HIGHLY APPRECIATED, SPAMMING IS NOT ALLOWED, IF YOU NEED BACKLINK CONTACT US. Get latest DamTops Posts, Latest Tweaks, How To's and Much More Straight Into Your INBOX For Free. Just Enter your email address, Verify and join our Newsletter!